Fancy something that’ll be as happy eating up the miles as it would be on a sunny Sunday B-road blast? 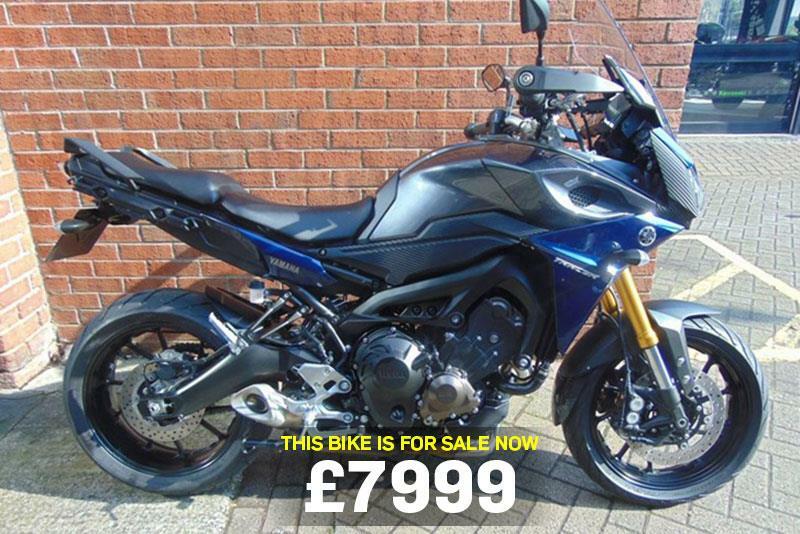 Then check out this MT-09 Tracer, which is todays bike of the day. "This Yamaha MT 09 Tracer has Just arrived in as a part exchange and a credit to its former owner. It has low mileage and is finished in Grey/Blue. Having covered only 1300 miles this one owner bike has a full service history and has the benefit of a tail tidy. The Tracer 900 is a perfect all-rounder and can not only tour but are great commuters and weekend fun bikes. With the added benefit of ABS this has to be one of the best bikes out there." "This is a seriously good bike at a seriously great price. We already knew the MT-09 platform had shades of greatness. With that stonking triple’s fuelling ironed out its status is confirmed: it’s both immensely versatile and thrillingly invigorating. The chassis, now the fork settings have been tweaked, is without criticism. The Tracer now adds to that with decent range and comfort, excellent all-round ability and impressive spec and sheen – without hurting that value at all. It’s great fun, characterful, useful and a bike for all reasons."